by marc / Monday, 08 October 2018 / Blog Category: Everything Vegas. Las Vegas is home to eight of the 100 Best Restaurants for Wine Lovers in America according to OpenTable users. New York City is the most recognized on their list with 12 restaurants on the list. Las Vegas is second with eight restaurants on the list. The state of California is tied with Las Vegas for number two on this list. Most of the great restaurants for wine drinkers are on the same street. Seven of the eight best restaurants for wine drinkers in Las Vegas are on Las Vegas Boulevard. Three of those restaurants are at the same casino! Technically, two of the restaurants are in downtown Las Vegas. However, the only restaurant not on Las Vegas Boulevard is Hugo’s Cellar which is located in downtown Las Vegas inside the Four Queens Hotel and Casino. You may notice that we reference OpenTable lists pretty often. There’s a reason for that. The information is compiled from real people dining out all over the country. This provides a well-rounded list. The 100 Best Restaurants for Wine Lovers In America list was generated from more than 12 million verified OpenTable reviews for more than 28,000 restaurants in all 50 states and Washington, D.C. between August 1, 2017, and July 31, 2018. 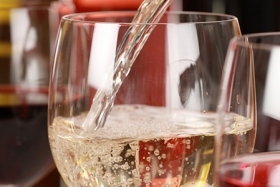 Caroline Potter, Chief Dining Officer at OpenTable had this to say about the list: “Whether you’re a wine aficionado or a novice looking to expand your palate, this year’s list showcases a variety of restaurants that carefully curate the finest wine selections to complement their menus.”. She continued, “From deep dives with sommeliers to approachable tastings to find the perfect pairing for any meal, these winning restaurants have earned rave reviews for their stellar dining experiences and impressive wine offerings. Without further adieu here are the eight Las Vegas restaurants that made The 100 Best Restaurants for Wine Lovers in the United States. I’m not sure that anyone can argue with the list since it’s based on real information from real people. Having said that, Las Vegas is an amazing city for wine drinkers. There are so many great fine dining restaurants with exceptional wine lists that it’s difficult to narrow the best to just eight. This list does highlight a few restaurants where you may not have to break the bank to explore different kinds of wine. While many of the restaurants are on the high-end of most budgets there are some exceptions. You should find decent prices and a good selection of wine at Mon Ami Gabi, Top of the World, and even Delmonico Steakhouse is relatively affordable for The Venetian. If you’re an oenophile or want to learn about wine you can start by visiting any of the restaurants on the complete he 100 Best Restaurants for Wine Lovers In America list.